You are here: Home / Ethnic Groups / The People of Sulawesi / Who are the Kaili Ledo? Who are the Kaili Ledo? 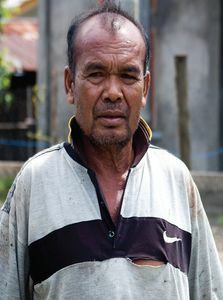 The Kaili Ledo people live in the northern part of Central Sulawesi. The area is very mountainous. Even so, Palu is known to be one of the driest place in Indonesia. The word ledo means “no.” Besides the prestigious Ledo (Palu) variety in everyday life, the people also speak ten other Kaili dialects. The dialects are named after their word for “no.” The Kaili Ledo language is closely related to the Baras, Kaili Da’a, and Kaili Unde languages. Family is very important to the Kaili Ledo. They give great honor and obedience to their parents and elders. Decisions are always made by the family as a whole, and they especially value the tradition of their ancestors. Marriage arrangements are a mix of Islamic and traditional influences. The bride price is negotiated by the families of the bride and the groom and varies according to the social status of the girl. Even though polygamy is technically allowed by both religious and governmental law, it is rare. After marriage, the couple usually lives with one of their families until they have a child. The Kaili Ledo villages are relatively small and stretch along the roads or waterways. The coastal Kaili Ledo grow rice and coconuts. A few earn their living as traders or government workers. Meanwhile those living in the mountain region make a living by planting rice and corn. Recently cacao has replaced cloves as a major cash crop. A kakula is a musical instrument (similar to a xylophone) played by the Kaili. The kakula also can be found in North Sulawesi, Borneo, Sumatra, and the Maluku Islands. It is made of wood about sixty centimeters long, two centimeters thick, and five to six centimeters wide, adjusted for tone. The kakula is often called Gamba-gamba. The vast majority of the Kaili Ledo people are Muslim. They are proud of their Islamic identity and seek to follow the pillars of Islam. However, their beliefs in magic and spirits are still evident and are combined with their religious beliefs. Many seek the help of a dukun (shaman/healer) to cure sickness or to exorcise evil spirits. When a new house is built, or when planting and harvesting, they perform ceremonies to the spirits to ensure good luck and good harvest. The Kaili Ledo need assistance to increase the quality and quantity as well as variety of their agricultural products. Formal education in schools, as well as exposure to new appropriate technologies could increase their employment opportunities and aid in the development of their local economy.